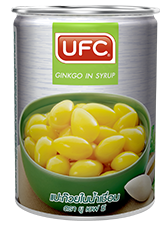 UFC is the first manufacturer in Thailand offer quality Gingko packaged in a canned format, providing clean, convenient and safe products that customer can consume instantly. UFC Canned Gingko can be served warm or cold, and with its gentle sweetness, UFC Gingko is ideal for both dessert and savoury dishes. We highly recommend warming UFC HomeSoy Original flavour slightly with UFC Canned Gingko; together they make a healthy take on a traditional Asian dessert we all love.